His Building Blocks: "Life Skills"
One of the things I am thankful for is being able to teach the kids life skills all throughout the day. Lately, Abbey has been a girl of many questions. She asks, "Why does...." all day long. I know, that could really be annoying. But, actually, for me it is very refreshing. It just shows me she has a love for learning. She wants to know why we do certain things, how we do them, and what they are. Recently, as she was asking me a series of "why" questions, she followed up with, "Mommy, how do you spell "Why?" Ha! These questions encourage me, because the goal of providing an environment that encourages the love of learning is closer to being accomplished. making banana bread by smashing bananas. Whisking the dry ingredients. 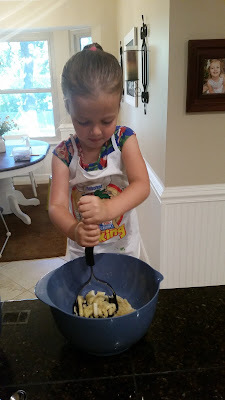 And, Abbey asked, "why do we use this whisk instead of a spoon?" Since the kids love to learn so much, we may as well throw in some life skills in there as well. Some of the life skills I try to encourage throughout the day is the importance of being neat and tidy. It's much easier to find something when everything has its place. Also, we are less likely to step on legos or little cars or pointy plastic action figures if we put them away when we are done playing with them. And, as I always tell the kids, "If you put something away when you are done playing with it, then you never have a big mess to clean up." We had a really long period of time where I would walk into Abbey's room and my mouth would fall all the way wide open in awe of the amount of mess that could be made in such little time! I am certain she pulled everything that had been put away in her room out and onto the floor in the middle of her room. Then, I would ask her to clean it and she would exclaim in an extremely dramatic, exacerbated tone, "But it's just too much!" So I made a new rule: I told her if she left something out that she wasn't playing with, I would take it away. So for the next few months, we had her toys taken away and tucked away in secret places all throughout the house--primarily in my closet and Drew's closet. Pretty soon, she didn't have very many toys to play with. But, it made things so much easier. And, after a while, she became more responsible. Things began to click. So, I slowly began giving her toys back to her. 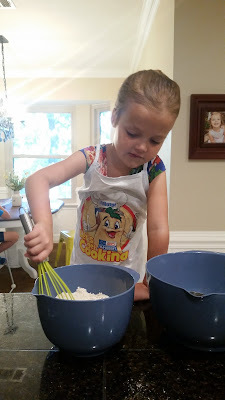 Of course, this whole process was not painless, but I am so thankful that I was with her all day every day to begin to drive home these important life skills. Luke is seven years old, so he has had so much practice, that he pretty much has it all figured out. He is great about making up his bed and keeping his room clean, and I very rarely hear him ask me to help him find a specific toy or lego, etc. Knowing that Luke had learned these responsibilities encouraged me throughout the difficult period with Abbey. There are so many life skills to teach the kids besides being neat and tidy though. On October 31, we acquired a new rental property. For those who aren't aware, part of my "job" besides homeschooling the kids and keeping our home and finances in order is to manage our rental properties. Managing these rental properties is very much like running any other business--try to keep expenses low and try to get the most rental income possible and increase cashflow. 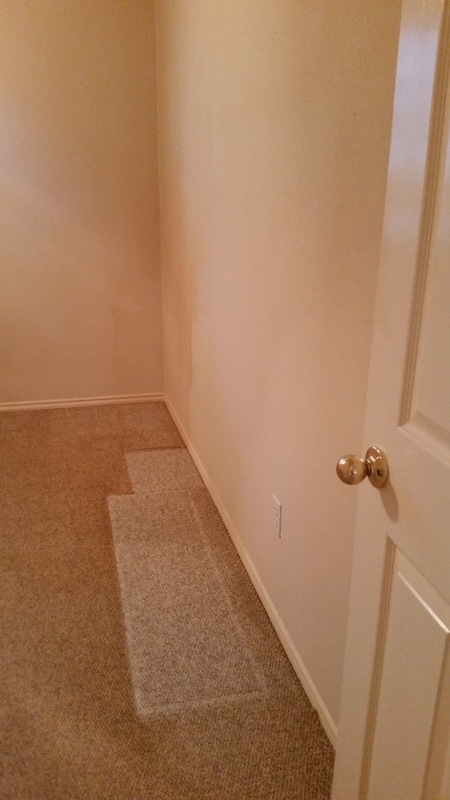 The kids have been along for the entire process of acquiring this rental property--from finding it (after looking at so many properties in many different neighborhoods), to closing on the property, to beginning remodeling it. All the while, I have been answering their many questions about the whole process and explaining what we are doing. 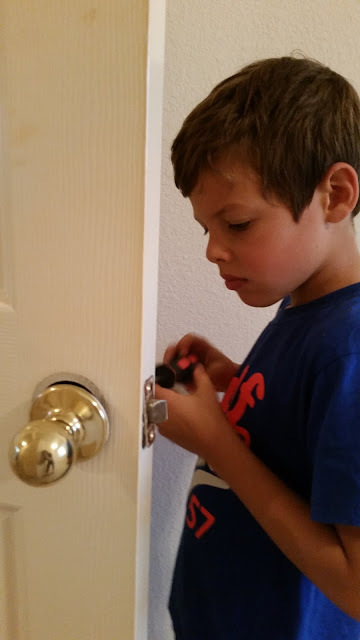 Teaching Luke how to remove doorknobs--using a screwdriver. I explained to him why we are taking these perfectly good (and ugly) doorknobs to replace them with new ones. This house has one room that was very obviously smoked in. 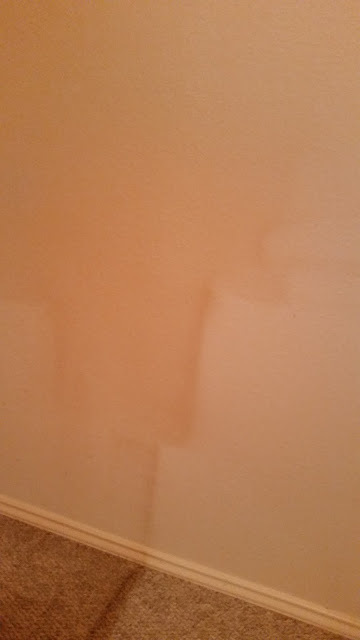 The entire room was yellow. See the door? Yellow. See the carpet? Yellow (except where they had some sort of cabinet or shelf. What is the life lesson? If smoking does this much damage to a home, what does it do to your lungs? After seeing how nasty this room was, my question was, "how can anyone continue to smoke seeing what it is physically doing to everything around you." Yuck! Of course, there are plenty of other life lessons as well--like the importance of taking care of things. And there are a plethora of business lessons: what work do we "have" to complete on this property in order to get it leased out for the highest possible rate. We have been to home depot about 30 times in the past week. We have met many contractors. The kids have watched me write several checks. We have enjoyed watching the home transform. There have been countless lessons in each of these things. So, in going along with this month's "Thankfulness" theme, I am so thankful for the opportunity to teach the kids all throughout the day--not just the basics of reading, writing, and arithmetic, but also in the countless "life skills" that you don't typically get in regular old school.